DealDash is a penny auction site where users have to pay money for each bid they place. This means you’re spending money regardless of winning. Some people call this system a scam. In some ways it is. There are many shady practices I’ve uncovered in this article that make Deal Dash seem not legit. But still, it is entirely possible to not only win on Deal Dash, but win a ridiculous amount of items while spending close to nothing. I’ll go through how exactly: DealDash.com works, what the products are, how the most active users make the most of their bids, and how you can game the system to, in essence, get unlimited free bids. These are secrets not commonly known, and aren’t shared anywhere other than right here on LetsGoBidding.com, the only place to get completely free Deal Dash statistics and strategy. You’ve seen the commercials. You can win that high end electronics device for mere dollars! Over 90% off retail prices! Obviously this sounds too good to be true, and if it were true it would be a terrible business model. Yet they have been going strong since 2009. A website that has to put “Fair & Honest” in its own title is already a little suspect. Let’s dive in to see if DealDash is as legitimate as their claim. We can see that the retail price, used for comparison, is the “Buy It Now” price. This is very important and we’ll come back to it later. The end price includes two factors: The price of the item it was bid up to, and the cost of each bid spent on the auction. Since bids aren’t free, there really is no upper limit to how much money someone can inadvertently spend on an auction. Even the people who don’t win end up losing money. This makes it different from what you would expect from a typical auction. Here’s another interesting statistic. 54% of auction winners save 90% off Buy It Now Prices or more. Is DealDash really giving away over half of their items at a 90% discount? The best way to check for good deals is to find how much the item sold for on Ebay.com. Whatever products are selling for (not being listed as) on Ebay is the fair market value of that item. Since many items on DealDash can also be bought on Ebay it’s easy to see how much real people are actually paying for them. A dinnerware set significantly overpriced on Dealdash. 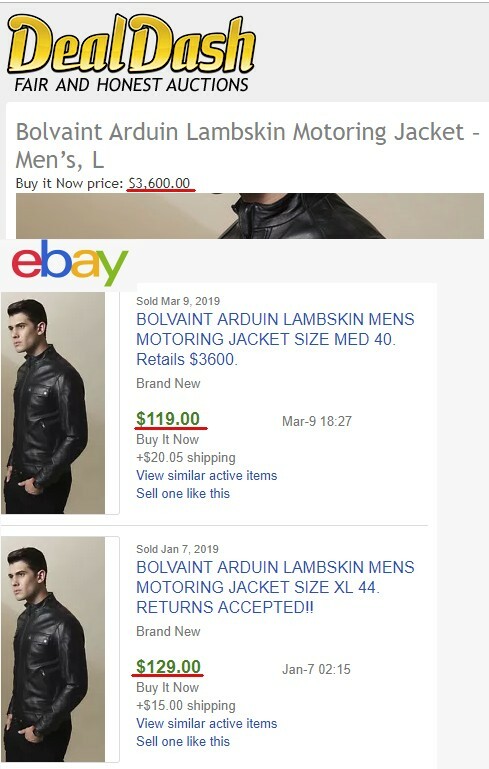 Another example where DealDash is claiming a jacket is worth 25-times more than what it sold for on Ebay. You’ve probably never heard of Galton Voysey, but you’ve definitely seen their products while browsing through DealDash.com. You can find a complete takedown of the company and its relationship to Dealdash. In summary, The founder of DealDash is also the chairman of Galton Voysey. Almost all of the products they make are manufactured in China and sold exclusively for Dealdash.com. It’s difficult to determine what all the DealDash products are, because they are designed not to be publicly associated with each other. I believe the following is at least a partial list of brands made in house and specifically marketed to be used by DealDash. Try to learn more about these brands and you see the same patterns. They have generic shopify hosted websites. And their facebook pages are mainly empty, with an impossiblely high number of likes. This doesn’t mean they are bad products, only that you know nothing about them; Which makes it difficult to tell what they are worth. 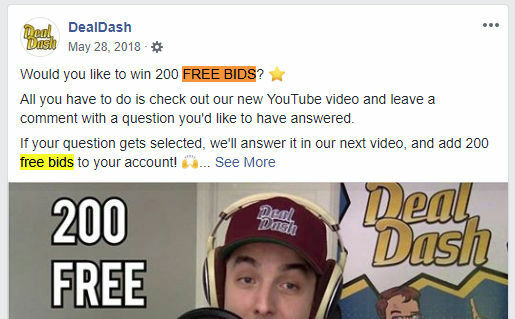 Deal Dash’s main claim to being “Fair and Honest” is that you can get your bids returned for free, if you buy the item at full Buy It Now price. Is this really fair when DealDash can arbitrarily make the Buy It Now price whatever they like? If anyone tries to sue them, they can point to these real products with real prices (that they control) to claim that the system is fair. If you don’t win, you can buy the product at retail value and get your bids back. Except the retail value is so much more than the item is worth. I don’t have statistics to back up how many people actually do use the Buy It Now feature, but it can’t be many. In most cases you would be spending multiple times more money than the product is worth. This is unfair to those who place bids but lose an auction, but is it even possible to win? B. Copy the url of the auction to an incognito browser. If it’s a beginner auction it will redirect you to the home page listing of all auctions. There’s no time limit here, you’ll keep getting the same items over and over again every couple minutes so wait until you see something you like. A better strategy would be to get whatever has the highest Buy It Now price, but I’ll explain that later. Just remember, this will be the only easy win you will ever find on Deal Dash. It’s designed to sucker you in, make you think you’re good at Deal Dash. The truth is, the game was rigged from the start. 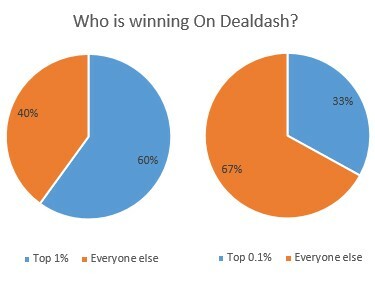 If you’re already active on Deal Dash, you’ve probably noticed a trend where the same people are winning every auction. You’ve certainly seen the name UncleTan before. This is because the same handful of people are winning most of the auctions. The top 1% of winners win 60% of all auctions. If you’re bidding against one of these professional auction bidders, you’re going to lose. Their reputation is what makes them so successful. Few people even try to bid against them. They will throw down thousands of bids exceeding an item’s value just so you will never try to challenge them again. This is a recent example where UncleTan won an auction by bidding over 8000 times on an inexpensive laptop. If we assume each bid costs $0.12 (which is a reasonable price for bids), UncleTan used over $1000 worth of bids to win a single $479 item. He may do this on any auction. You would be foolish to bid against him. You might be wondering about the people who are winning thousands of auctions, what are they doing with their winnings? The answer is critical to how Deal Dash works, and it isn’t what you expect. I have heard the theory that there is a cabal of elite Deal Dash users winning all the auctions so that they can resell the items on Ebay for profit. There are a few problems with this theory. First, if this was a feasible strategy, wouldn’t it make more sense for DealDash to skip the middle man and sell all their in-house products directly on ebay? One problem, as we’ve already shown, is that items consistently sell on Ebay for a small fraction of what DealDash says they are worth. While we do see exclusive DealDash products being sold on ebay, we can easily check the scale at which this is happening. On this site I have records of every auction won on Dealdash.com. 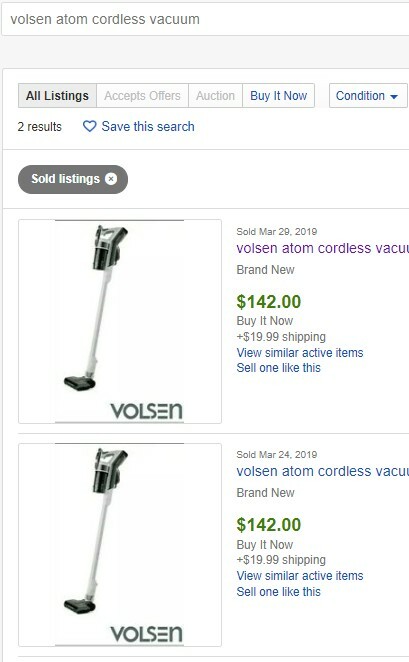 I can take a popular Deal-Dash-Only item such as the Volsen Atom Cordless Vacuum and compare how many times it has been auctioned off on DealDash and how many times it has sold on Ebay in the past 3 months. My statistics show this vacuum cleaner has been won 440 times on DealDash the past 3 months. During the same period, it has been sold on ebay twice. The volume of DealDash exclusive items being re-sold on ebay is nowhere near high enough to explain what all these consistent winners are doing with their thousands of wins. We’ll take a closer look at one of the most eye-brow-raising products being sold on DealDash to get a better picture(or should I say painting?) of what is really going on. All their paintings are conveniently anonymous, but trust them, these are works of arts worth thousands of dollars! Odder still, they aren’t anonymous. All of them are signed, often by the same artist. Their facebook page is completely empty, except it has over 1000 likes! Also their website has been Suspended for some time, but even looking at it on the wayback machine, there was never anything on it. Yet still, somehow, an endless stream of anonymous paintings are making their way onto Dealdash. 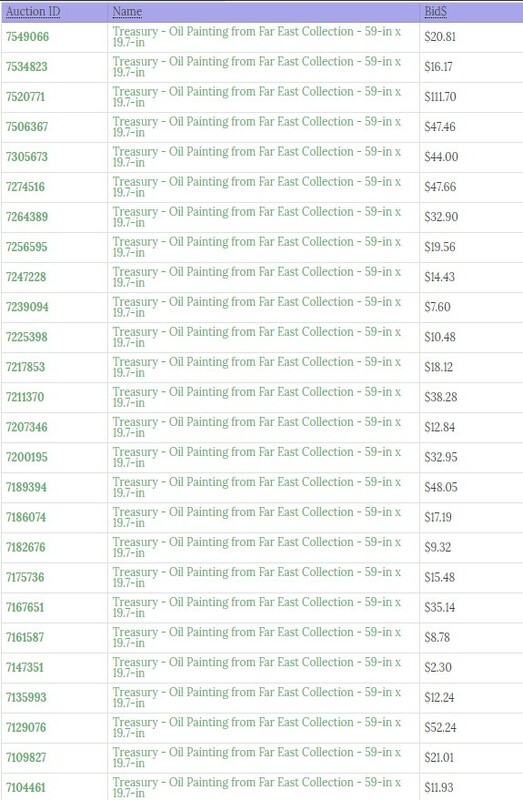 Look at the statistics for any of the Far East Collection paintings on the letsgobidding.com website. You will see that the same painting has been auctioned and won dozens of times before. Too add another dimension to this, I was able to find this exact same painting listed on ebay, which has been sitting unsold for months. At the same time the very same painting was being auctioned on DealDash. If you look at the details I’ve collected on this site, it seems the same paintings get auctioned off every 4-5 days. Unlike other auctions, there is no list of previous winners or any indication that this item has been won before on DealDash! I suppose it’s not technically illegal If DealDash has a factory of people making the same painting over and over again. Although, is a retail price in the thousands really right for this type of artwork? This is an interesting view into the sketchy business practices surrounding Deal Dash, but it still doesn’t explain what all the winners are doing with their spoils. I don’t have much proof, but I have a pretty good theory. Let’s put aside the theory that DealDash has a bunch of fake accounts that bid up auctions and prevent you from winning. DealDash isn’t scamming you that obviously. They don’t need to do that because their own users will do it for them. Every time you win an auction, you can either buy the item at the auction price, or return the item and get a number (typically the Buy It Now price) of bids in return. My theory is that all of the frequent bidders, including UncleTan, are exchanging wins for bids on just about every auction as a means to increase their pool of bids. For free. To make this theory work, we would have to see that the top bidders are able to consistently win auctions with fewer bids than the Buy It Now price. If they won an auction while using less bids than the Buy It Now Price then they could exchange that win for more bids which would net them even more bids than they started out with! For example, if someone won one of the Far East Collections paintings with 1000 bids, and the painting had a Buy It Now price of $2000. That win could be exchanged for 2000 bids. It would double the bids and cost nothing. And it’s true! Look at the statistics, there are many big players who are winning auctions with fewer than the Buy It Now price number of bids. As of this writing, UncleTan has a system where he can get back 132% of all bids he places. He’s not even the best at this trick. I think this theory makes the most sense, how else can these players put down thousands of bids on items they couldn’t want, have no use for, and aren’t re-selling on Ebay? It’s because they don’t want the item, they want the bids. It’s a never ending cycle of farming bids so they never have to pay for their own. During this time, DealDash is profiting off the 99% of users who can’t see what’s really happening. I’ve gone through multiple facets of how Deal Dash works in this article, and they all fit together into the overall profit model of DealDash. It’s based on 5 core principles. The majority of the Products auctioned on DealDash are made cheaply by in-house companies who are designed to have their products auctioned on DealDash. Since DealDash controls the retail pricing of these products they can market them as “luxury” items worth an excessive amount. This leads to elevated Buy It Now prices. Smart users take advantage of the high Buy It Now prices to win auctions below that threshold so that they can exchange them to increase their bid pool. Everyone else who may actually be interested in buying the products has to compete with users (with nearly unlimited free bids) who are bidding only to increase their bids. Buying the item at Retail price to get your bids returned is a sham. The products are worth nowhere near their Buy It Now prices and nobody does or should use that feature. People who lose auctions lose all their bids and that goes directly into DealDash’s profits. Put it all together and the average DealDash user will find themselves out of a lot of money with nothing but a beginner auction beanie to show for it. DealDash has tried to remedy this somewhat with their No Exchange auctions. I don’t see those any more, and I wouldn’t expect them to keep it up. Take away the exchange for bids option and the whole profit system falls apart. It might also reveal the secret that their most active users are exchanging instead of buying. There’s really only one way to win. If you can’t beat them, join them. Learn from the big players on how they are able to win auction after auction with the least amount of bids. You can go through each of the auctions they participate in and how they won. Learn which auctions have the best return, which other users to avoid, and when to admit defeat. Even the best don’t win every time. 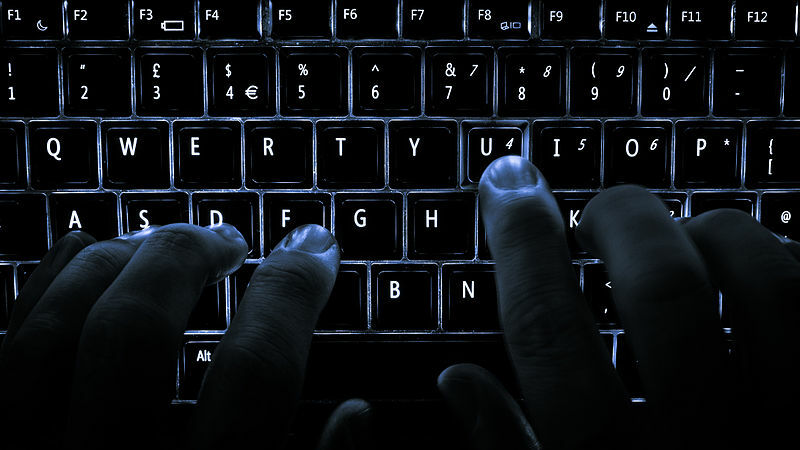 All the statistics and tools you need to win are right here on LetsGoBidding.com. It’s completely, and always will be free. Go ahead, sign up, buy your first bid pack, use one bid to buy the highest Buy It Now priced item you can get from a beginner auction. Then exchange it for more bids. Keep using your bids to win more auctions you can exchange for more bids. Soon you’ll have enough bids pooled up that you can try to get one of the serious items: A new Iphone, or even a car. Most people who have only seen the commercial won’t know all this. For them, Deal Dash is one big scam and they’re going to come out of this much poorer. But if you’re smart, and you understand what it takes, you have a very good shot at coming out ahead. Deal Dash isn’t a scam. It’s just shady capitalism that anyone can take advantage of, but only if they know how. DealDash.com is a bidding site that requires a good deal of skill and knowledge to excel at. Since I discovered UncleTan has been beating the system for all these years, I realized we need a new metric to gauge users to see who is bidding effectively and who is wasting bid after bid. Use this scoring to see who on Dealdash is the best at winning auctions while spending the least amount of bids. Then, since you can look at each user’s bid history, you can look back to figure out how they are doing it. With this information, you can either learn from it, or avoid bidding against them in the future. They won this auction with significantly fewer bids (300) than the Buy It Now Price (600) this gives a good low ELO sore. The score takes into account all recent auctions a user has participated in, even auctions they didn’t win, and sums up all the bids. It will only change gradually and reflects the overall performance of a user. If someone has a 0 ELO then that just means there isn’t enough information yet to evaluate their raking. Anyone with an ELO score of less than 1000 is on average winning auctions with less bids than the Buy It Now price. Most auctions you can “exchange” after winning for bids equal to the Buy It Now price. This means anyone with less than a 1000 ELO is likely a skilled user who is gaming the system to avoid paying for bids, like UncleTan. Anyone with a higher than 1000 ELO needs to continuously purchase more bids to stay in auctions. Even though UncleTan is the most prolific DealDash user, he is not the best. Below is a perpetually up-to-date list of the current Deal Dash “winners”. Every one of these users, in theory, has unlimited bids. They can reliably win auctions and then exchange their wins for more bids than they spent on the original auction! If you’re serious about your penny bidding, then you will want to be on this list. There is one regular user on DealDash who appears to bid on nearly everything, and usually wins. He is UncleTan and he has won literally millions of dollars worth of auctions. Since this site has a great deal of historical auction data, it’s easy for me to go back and analyze how UncleTan has become the best DealDash bidder, by a large margin. UncleTan Wins half of all auctions he participates in. Which is impressive considering he doesn’t put down that many bids on each auction. He’s also won well over 6,600 times. Actually, probably quite a lot more. I only have statistics going back a year or so and he has been bidding since 2012. You can see all this information and his recently won auctions on UncleTan user statistics page, but I wanted to dig deeper to really figure out what sets him apart. First, I tried to figure out what he is doing with his winnings. Either he has a warehouse full of crap he won or he’s selling the thousands of products he’s winning. I searched on ebay and google for anyone selling any DealDash specific merchandise. Bolvaint, Wilcott Weaves, and Kamikoto are some of the UncleTan’s favorite brands and are generally only purchased new from DealDash. I found very little. no one is selling these products at the scale required based on how quickly he is winning them. There is a third option, one which has an insane implication. He is exchanging every one of his winning auctions for more bids. Every time you win an auction on DealDash, you have two weeks to either pay the auction price or exchange the item for bids. The bids are typically the Buy It Now Dollar amount but can be slightly less depending on how DealDash calculates a fair ratio. This is one of the ways to get free bids from DealDash. The question is if UncleTan can use this method to perpetually receive free bids. To do this we have to compare the number of bids UncleTan is putting down with the Buy It Now prices of the auctions he is winning. This will give a good estimate to see if he is consistently able to win auctions by putting down less bids than the Buy-It-Now’s dollar amount. For example, if he could win a watch with a $100 Buy It Now price with only 50 bids then he could exchange it for bids and end up with 50 MORE bids than before he entered the auction. I looked at the last 1000 auctions UncleTan has participated in and added up all the bids he made and the cumulative sum of the Buy It Now Price for each auction he won. It’s as I expected. UncleTan is consistently winning auctions by 60% of the Buy It Now price. This means on average he can win an auction with 60 bids and exchange it for 100. He has an infinite free bid generation machine. 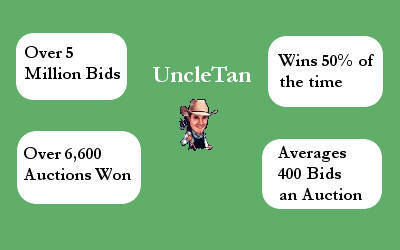 I think there are a couple factors that help UncleTan win by placing less bids than anyone else. First he chooses his auctions carefully: Often he will pick auctions with the largest margin between the average auction selling price and the buy it now price. Lately he’s been heavily hitting the various Wilcott Weaves rugs, each has a Buy It Now price in the thousands and frequently has an ending auction price of $20 or less. Finding smart auctions like this makes it easier to receive more free bids than you send out. Secondly, UncleTan has a reputation on DealDash. Anyone who’s spent a small amount of time on DealDash.com knows that he is a high roller. If you’re in an auction against only him there’s a very good chance you are going to lose. Often he will bid far more for an item than it is worth. This dissuades anyone from joining the auction if they see he is bidding in it, which causes the auction to end sooner than it otherwise would. Is anyone else doing this? I think some of the other big players are trying to do more or less the same thing, but less effectively. Each of these have a Buy-It-Now to Bid ratio of less than 100% which means they could be generating more bids by exchanging. maxwell44(64%), Podewiz(73%), TexasGMen(94%). You can see a complete list of skilled DealDash users who are gaming the system by learning about this site’s ELO rating. As far as I know, no one else knows this is going on. I’m calling the process of using your bids to win auctions you don’t want so that you can exchange them for yet more bids: Farming. In theory anyone can start bid farming on DealDash. You can do it easily if you use the free statistics on this site to find the best auctions for getting a higher return. I think it’s entirely possible to create an infinite bid generation system with only the bids in your first bid pack purchase. With some luck you can be the next UncleTan and win whatever you like without every paying for bids again. Happy Bidding! Think you’ll get that brand new iPhone for 69 cents? Unlikely. 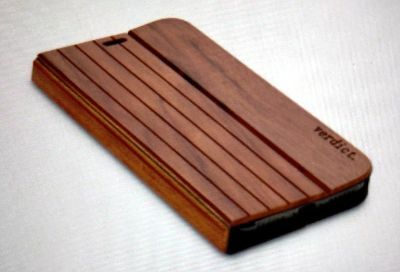 But you could pick up a fancy iPhone case for under a buck. Here are some of the names you’ll find in the lower-priced tier of products on DealDash. With careful bidding you could pick up many of these items for next to nothing. Honestly, about half of the list of 100 products is made up of Ashlynn Avenue jewelry. Good luck finding anything about whatever company makes these or where they come from. If it’s gold, it’s gold plated. Nothing they make is worth more than $12 on eBay so if you can pick it up for under a buck that’s a great deal. Another company you probably never heard of. You can get Cheap phone cases from the iPhone 6 and up. Again these aren’t really worth any more than $12 and often a lot less, so if you’re spending more than a buck on one of these, you’re getting ripped off. Luckily it’s easy to pick up one of these for under $1. Verdict also has some clothing like hats and underwear if you’re into keeping your body covered by synthetic fibers. Use bids to get more bids? Sure why not. 100 bid packs are the easiest to get for under a dollar. About a quarter of all auctions end at less than $1. As the size of the bid packs increases the inverse happens to your chance of nabbing it at a good price. 800 bid packs sell under $1 only 6% of the time, and forget about anything bigger. 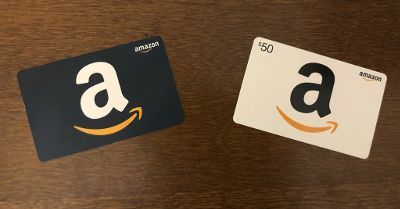 The gift cards that typically sell for under a buck are also most often used to buy the other sub-dollar items from companies you never heard of, only at retail price. that $50 Barrel Shack gift card is worth about $1 since Barrel Shack products are generally worth 1/50th of their retail price. But it’s not a bad idea to get these if you wanted to exchange them for Free bids. And without further Ado, below is the continuously updated list of the most popular auctions selling for less than $1 during the previous month. DealDash is a penny auction site that requires you to pay money for each bid you place on items. You are paying money regardless if you win the auction or not. There are several ways you can receive free bids, either with coupon codes, doing specific things online for Dealdash, or just by bidding. There is a caveat, if you’re hoping to bid on items for free without first paying for bids then you are going to be disappointed. 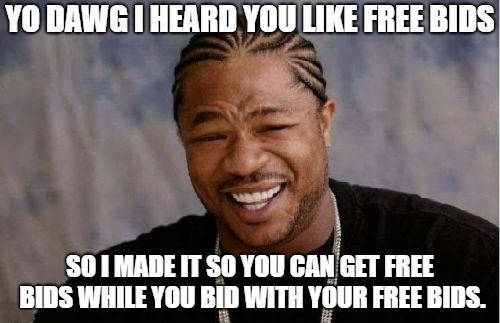 There simply is no way to get free bids without first putting in your credit card (or paypal) and paying for your first bid pack. In this way you’re really just diluting the cost of your bids by mixing in free bids with your paid ones. Use these tips and you will have a significant amount of bids at an overall low price, but it is impossible to use DealDash without first paying for a starter bid pack. Get 100 free bids to use on DealDash when you purchase your first bid pack by clicking Our promotional DealDash link and using the promo code “best-penny”. This saves you at least $12 in bids! DealDash regularly updates their Facebook Page with offers and promotions. Mostly it’s a list of new expensive products they are auctioning off but occasionally they also have competitions or social media tasks for you to do to get free bids on your account. Usually it’s something simple such as liking or commenting on their content. They might also want you to take a picture or video of yourself enjoying the fruits of DealDash.com. There’s an ongoing promotion on DealDash where you get an extra 3 bids by typing something into the bio section of your profile. Just put whatever you want in there as long as it’s friendly and follows the rules. It will have to go through review first before you get your bids which might take a little while. DealDash.com has a feature where you get free bids while you bid called “Time as highest bidder”. Basically, you fill up a bar by being the top bidder in an auction. Each bid can only be highest bidder for a maximum of 10 seconds until you either win, or someone else places a bid. The speed the bar fills up depends on the multiplier, which changes from day to day. You only get your free bids when the bar is filled. The amount of free bids you receive depends on your “level” which goes up each time the bar is filled. There’s a few strategies to get the most out of “Time as highest bidder”. Only bid on days with multiplier. A 4x or 5x multiplier will fill your bar and level you up much faster than the common 2x day. Avoid bidding on popular auctions early on. When you bid on an auction early, you’re less likely to be highest bidder for the full 10 seconds before someone else places a bed. Wait until the auction is established and everyone is using their Bid Buddy to automatically place bids. There are many auctions on DealDash you can win with very few or even 1 bid. They’re typically low value gift cards, clothing, jewelry, and other items DealDash clearly has a surplus of. After you win one of those auctions you can go to the Pay For It Now page and you get the choice to either pay the auction price or return the item in exchange for bids. The number of of bids you receive is usually the same as the “Buy it now” price in dollars. If you win an auction worth $50 with a single bid, you can convert your one bid into 50 free ones! There may be a limit to how much you can do this as many items you can only win once. You get all your bids you spent on an auction back for “free” if you buy the product at retail price. Keep in mind the retail price you’d pay to buy the product is often much more than what it could be bought on Amazon or Ebay. The bids you get back might not even be worth the difference in price, but if you did accidentally put in way more bids for an auction than you should have than this can be an easy way to get those bids back. You get all the free bids you want when you use a different site that always lets you bid for free. DealDash is a risky business and you could end up spending more on bids than what you get back in products. There are plenty of other auction sites where you can get great deals and the bids are free, such as Ebay or Tophatter. Keep in mind that DealDash is just something to have a little fun with if you don’t mind spending spare money. DealDash is competitive and many high-roller players will throw down thousands of bids on an auction without blinking, so be wary and just remember to have fun! Each auction on DealDash.com follows a unique path to its conclusion that depends on the people bidding. Some auctions end immediately at $0 with no one bidding while others stretch on for days or even weeks with high rollers queuing up 1000’s of bids at a time. If there is a car on DealDash it is extremely unlikely for that auction to end early. However, there are many other fairly expensive items that frequently go for a couple dollars or less. The trick to know which items these are and then use the information on this site to form a strategy. For example let’s take this nearly $900 pot Aava Elements Stainless Steel Casserole Pot. It’s a fairly pricey item that frequently is bought at an exceedingly steep discount. There are even times where it only had a single bidder who got it for $0.01, although more frequently it goes for less than $3. I believe there is a specific reason why sometimes auctions end early and other times they drag on for hours with continuous bidding and that is because of people’s expectations. If someone is bidding on an expensive item they don’t expect that item to sell for a cheap price, so when the bidding is at 5 cents people typically won’t want to throw down hundreds of bids because the auction is unlikely to end soon and their bids would be wasted. If this sentiment is shared by nearly everyone bidding on the item then the opposite will happen and the auction will actually end soon because no one is willing throw in early bids. This gives you an opportunity to swoop in and take the item for cheap with a little early aggressive bidding. The key here is to know what types of items this strategy works on and when to apply it. Medium or low popularity items are frequent on Dealdash and will give you the best likelihood of having early ending auctions. The time and day of the auction is also important. You will be bidding against fewer competing bidders during workdays and in the middle of the night, and the less bidders means the auction is likely to end earlier. You can see on letsgobidding.com the history of a product’s auctions and you can see at what time the early ending auctions started. You should also use this site to see who you’re bidding against at the beginning of the auction. You can look at each user’s history to see if they are someone who only puts down a few bids at the beginning or someone more aggressive with wining early auctions. And as always, stay away from the high rollers who will put seeming incomprehensible amounts of bids down for garbage products. If you follow these strategies you should be able to consistently win auctions while spending less than the Buy It Now price, but keep in mind this strategy is useless for very popular items like Computers or Phones, for those you shouldn’t waste time on Dealdash, get them on Ebay. Is DealDash a Scam or Not? You’ve seen the commercials where people on DealDash claim to buy high end electronics for ridiculously low prices: IPads for $10, Laptops for $20, etc. Are these deals too good to be true? The short answer is, no, DealDash is not a scam. But that really depends on how you use the site. If you consider DealDash as a store where you give them $20 and they hand you a brand new IPhone then the truth is that will *Never* happen. If you log onto DealDash today and try to buy a new phone through bidding, you will almost certainly pay more than the phone is worth through paying for bids. And that’s the trick they never mention on the commercials: You have to pay money ahead of time each time you want to bid on an item, and that money isn’t included in the $20 final price for that hot item. Using this website, letsgobidding.com, I can see that the Last IPhone X sold for $537.64, with bidding going on for 5 consecutive days! That means there were 53,764 total bids. If we assume that everyone bought their bids on sale for the cheapest 12 cents a bid then at least $6,451 went into that auction, and then some lucky person had the privilege to pay more money again to actually buy the thing. In this case DealDash earned about 700% what the phone is actually worth. Clearly from this perspective DealDash is a scam that you shouldn’t bother with. Why should you pay so much money for miniscule chance that you will actually win? But there is more to DealDash than that they are evidently making a ton of money off of suckers. DealDash is best viewed as a form of risk taking gambling. In some ways it is similar to the lottery. You pay money for the chance to win. The more money you put in the higher the chance of you winning. In the end, most people win absolutely nothing. But some people do win. DealDash is different from the lottery in that there is more strategy than picking random numbers, and that strategy is the major difference between the winners and the losers. In each game of chance there is information hidden from you that keeps the odds of winning against you. For the lottery, if you knew the winning numbers you could win instantly. In poker, if you knew every player’s hands you would already know who is going to win before the end of the round. For slot machines it would be how many spins until the machine pays out. Some of this information is random and there is no way to know what it will be ahead of time without inventing a time machine. Other times it is not as random. A talented poker player can guess their opponent’s hands by carefully studying their behavior. A blackjack player can try to count cards to give an edge in the probability of the next card. Without any strategy the odds in DealDash are strongly against you. For the IPhone, there were 255 bidders competing against each other, with only one being able to win. Additionally, out of 53878 bids, only one will be the winner: the last one. Roughly that leaves you with the odds at 1:255 that you will win, and 1:53878 that your bid will be the winning one, or 0.39% and 0.0019% respectively. Those odds are terrible and it would be impossible to win anything with those. But we can improve those odds significantly if we understand one thing. What is the information hidden from us preventing an easy win? Players on DealDash know that it’s very unlikely any one bid is going to win an item for them, with the odds so low with individual bids. To compensate they queue up hundreds or thousands of bids to increase their odds of winning. The only way to know if any single bid is going to be the winner is to know exactly how much everyone you’re bidding against is going to bid. Let’s say you’re bidding against two players, one is a cautions new player and will only put 100 bids into that IPhone before giving up, the other is a dedicated bidder willing to put down 5000 bids. If you knew that you probably wouldn’t start bidding on that auction! It would take you forever trying to edge out that dedicated bidder. Not to mention the 5000 bids you’d need to win are awfully expensive to buy ahead of time. With that information you could easily know which auctions are close to their end, where you could swoop in and win them at a great price without wasting too many bids. And you would know which auctions aren’t worth your time because someone is trying too hard to win and still has a lot of bidding left. While you will never know that exact of information there are ways to get an approximation of what sort of bidder you are going against. I am alluding of course to historical information for every auction and user on DealDash. Wouldn’t it be useful if you could look back on each user’s bid history and see where they gave up after 100 bids or kept on bidding through 10,000? If you knew which ones were the high rollers and which ones were skittish to put in the big numbers, then you’d have a pretty significant advantage in winning auctions. Now you can have all that information for the low low price of: NOTHING! 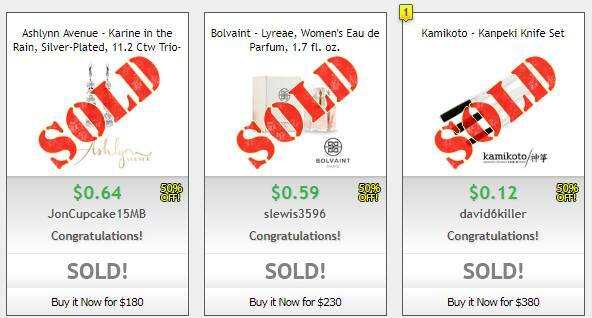 It’s all free on letsgobidding.com, no signing up or credit card information required. Other sites charge you as much as $30 a month to look at this same information and I’m giving it away for free. You’re right, I am a nice person. Happy Bidding! Dealdash.com is a penny auction site. Penny auctions work differently than convention auctions in many ways. For one, the price of the item increases only one cent for each bid. This leads to much lower prices for items, however, you have to pay money ahead of time for each bid you make. Each placed on DealDash increases the auction timer to 10 seconds and the auction price by one cent. Whoever the last bidder is when the auction timer reaches zero is the winner of the auction and will be able to buy the item at the bid price. Before you can start bidding on auctions you will need to purchase bids ahead of time. There’s usually some sort of sale going on each day where you can buy bids for a few cents each. A 300 bid back at 13 cents a bid will cost $39, sometimes bids are priced a little more or less. Once you buy the bids you will be able to place them at auctions. The bids you bought are only good on DealDash and you will not be able to get that money back. You can only use those bids to try to win products on auctions, or more likely: you will spend all of your bids and end up with nothing. DealDash does allow you to have your bids returned to you if you lose an auction by purchasing the item anyway at their Buy It Now (or BIN) price. In this way, you can use DealDash as a store to purchase items at their full retail price and you won’t have to worry about running out of bids. This can be a good idea if you want to try to win an auction for an item you were already planning on buying. If you win, you’ll get a good price. If you lose, you can still get all your bids back and get the item at retail price. 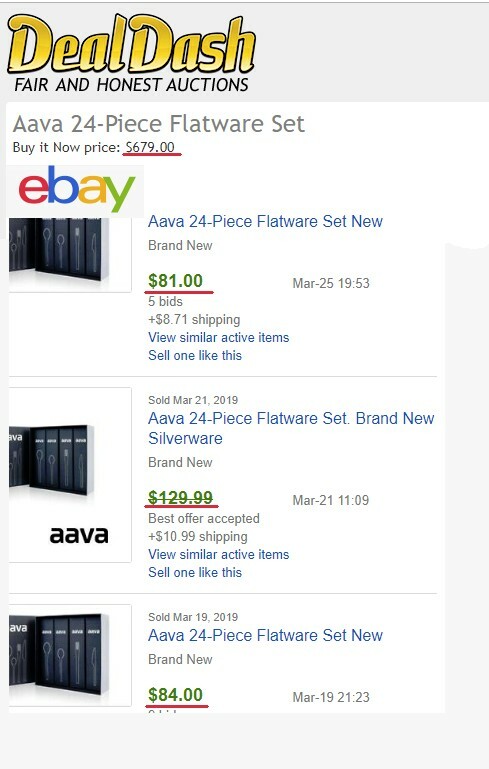 Often the Buy It Now price is significantly more expensive than what you could have bought the same item for on Amazon or Ebay, sometimes by hundreds or even thousands of dollars. Let’s look at an example of bidding on an auction. There is a brand new Apple IPad for sale on DealDash you are interested in bidding on. The auction ends in 5 minutes. You will only be able to place a bid during the last 10 seconds of the auction. The auction gets down to 3 seconds and you place your first bid. The auction timer resets to 10 seconds and for 9 of those you are the winner of the auction. Then in the last second someone else places another bid and replaces you as the winner. Use your BidBuddy. It’s guaranteed not to bid more than your fair share and the auction will never end with someone else winning as long as you have bids queued up. Also keep in mind there is a threshold on auctions preventing new bidders from entering an auction. Typically, it is $5.00 but it can change from day to day and auction to auction. If the current bid is over the threshold, then you can’t bid on that auction unless you already placed a bid earlier before the threshold was reached. For popular items it’s common for people to place one bid at the very beginning of the auction and then start more actively bidding after the auction has been active for some time. In this way you can “save a seat” on auctions you may be interested in bidding on later. Blocking new people from bidding on an item after the threshold is reached limits the bid price from climbing too high with new bidders joining in and bidding up the item to perpetuity. For our IPad example, let’s say you queue up 100 bids in bid buddy for the IPad auction. Against 3 other people you’ll likely run out of bids when the auction gets over $4.00. If the 3 people you’re bidding against each will give up after 80 bids, you should win the auction on your 81st bid. Then you could buy the IPad at about $3.20. But if you include the cost of your bids at $.13/each the total price you are paying is about $10.53. While it is possible to get very good deals on DealDash you shouldn’t be deluded into think that is the norm. High-end electronics are typically only won after days of bidding with the winner typically putting in thousands, if not 10s of thousands of bids, with the final price not being that much lower than retail. Keep this in mind as you start bidding and try to win some of the lower priced easier auctions before getting into the big games. Gift cards, jewelry, and clothes are all great areas to start where you can find winnable auctions. Once you know how to bid and don’t set your sights too high you should be able to start bidding and winning auctions on DealDash. Just don’t take it too seriously, don’t spend too much on popular auctions, and have fun!